Birthdays at my age aren't exactly events to celebrate. They're sometimes days to be a little afraid of. Nonetheless, thanks Wiseman, the birthday song is special. Thanks Ma, Dad and family for your birthday wishes. And, a big, big thanks to my wife and daughter for my gift. 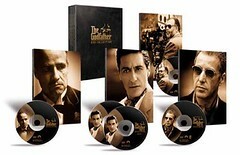 Oodles and oodles of The Godfather. I got the box set! I'm so not worthy of this wealth. Happy Birthday Dave! I won't mention your age...but I'll be joining you there in 3 short months. My how life just flies by!! Hope you enjoyed your day. Thanks Maria! It was a great evening, but I might have to wait for Frankie to turn 4 before viewing one of my new DVDs. We'll see. Afraid of what? You don't look like you're THAT old! Afraid? Something to do with the whole job thing - long story. Thanks for your wishes and happy 49th a bit in advance. worthy or not, i'm ABSOLUTELY envious. Happy birthday!! Thanks Jon. My wife said she got lots of envious comments from other guys in line while she was buying it. I can't wait to get into the first one. Hope your weekend in New Jersey was relaxing. I just found your blog and have marked it. It's exciting for me to find a site presented by a person from my beloved hometown of Columbus! It is a very nice gift, but, you know, someday - and that day may never come - they'll call upon you to do a service for them.